The Chihuahua is the smallest breed of dog; it is also one of the most popular dog breeds in the world. They are named after the Mexican state Chihuahua where they were discovered. Picking a perfect name for Chihuahua is not easy as there are a lot of things to consider such as gender, coat color, size, origin and temperament etc. An easy way to get a Chihuahua name is to consider these personalities one by one. 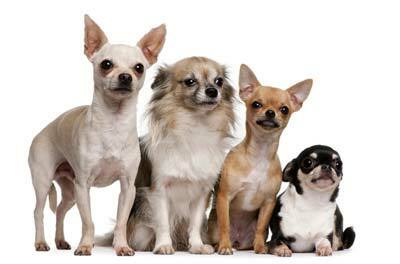 Since Chihuahua is the smallest dog breed, names that mean little, small, minor, tiny fit the breed well. For example, Lassie means little girl, Mina is an Irish Gaelic name means "smooth, fine, small". Pablo is a Latin dog name which means small. Tina can be used for a little girl Chihuahua and it means tiny. More Chihuahua names related to little, small, minor or tiny contain: Alan, Amy, Bailey, Berg, Booth, Boris, Brenna, Brier, Brooke, Calvin, Cameo, Carlin, Christina, Cinnamon, Dart, Devi, Dice, Eric, Eva, Gavin, Gore, Hamlin, Jo, Kane, Kipling, Lana, Lassie, Logan, Lottie, Marcel, Mercedes, Merritt, Mina, Minor, Nina, Nova, Oscar, Pablo, Paula, Richard, Rowan, Santos, Sonny, Sterling, Tad, Tina, and Wren. One of the most predominant features of a Chihuahua is its coat color; it can have any color combination and can be solid or mixed. The most common colors are brown, red, cream, chocolate, white and black. In fact brown, red, cream and chocolate colors are very close; they are all in the intensity of the red pigmentation. Chihuahua names related to red and above colors are Almond, Apple, Barley, Cherry, Chestnut, Chocolate, Cinnamon, Copper, Hazel, Mango, Peach, Peanut, Penny, Persimmon, Ruby, Rusty, Speckle, Suri, Wine and Woody. Names for a black Chihuahua are Ant, Blake, Carey, Chocolate, Coffee, Dolan, Jet, Kerry, Lena, Mela, Nigel, Oreo, and Tux. We seldom see white Chihuahuas, but we have lots of names for them: Alva, Angel, Blanco, Cotton, Elva, Fiona, Ivory, Lily, Luce, Misty, Snow, Snowball, Spark, Yuki, Yukon, and White. Do not forget Latte and Mocha, I really like them, they are perfect for the red, black and white mixed Chihuahuas. We know that Chihuahua is originated in Mexican, which is a Spanish speaking country, so we can get the inspiration from the Spanish language. Our Spanish Chihuahua names include: Alma, Amigo, Bambino, Bario, Belinda, Beso, Chico, Eva, Hola, Hombre, Inez, Mescal, Nina, Nola, Pacco, Pappi, Salsa, Tico, Vargo, and Vena. If you want a common and popular dog name for your Chihuahua, then try these top 10 Chihuahua puppy names: Daisy, Lola, Bella, Coco, Chico, Rocky, Peanut, Roxy, Princess, and Angel. They have been proved to be perfect for Chihuahua dogs if you do not care naming duplication trouble. If you are not satisfied with the above dog names, they try out more Chihuahua names here: Ant, Baby, Bambi, Beanie, Bella, Belle, Brownie, Bunny, Candy, Chi Chi, Chili, Chipper, Dinky, Elf, Honey, Jazzy, June, Karma, Kissy, Lucky, Lucy, Mina, Mini, Nacho, Pablo, Pinky, Rambo, Romeo, Snippet, Speck, Tikki, Tina, Tinkerbell, Tiny, Zippy. Please keep in mind that the dog name you chosen should fit the personality of your puppy, also try Chihuahua dog names at idognames.com here: Chihuahua dog names.